Property Finance is an authoritative guide to both the financial and legal issues surrounding real estate financing. Unique in its exclusive focus on the topic, this book builds from a solid theoretical foundation to provide practical tools and real-world solutions. 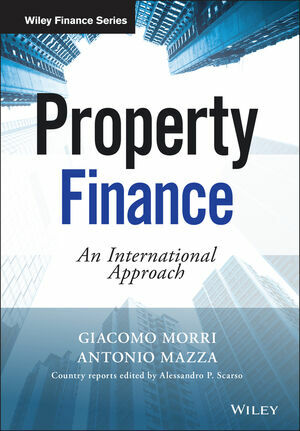 Beginning with a discussion of the general issues encountered in real estate finance from an international perspective, the authors delve into country-specific information and set out the legal peculiarities of eight important countries (Germany, France, Italy, Spain, China, India, England and Wales) by asking questions of relevance to the leading local law firms specializing in real estate financing. The reader may thus consider in greater depth the problems relating to any given country and compare and contrast the positions under different legal systems. Examples with numerical calculations and contract excerpts enhance the explanations presented, and are immediately followed by practical case studies that illustrate the mechanisms at work. The companion website features downloadable spreadsheets used in the examples, power point presentations, as well as real estate news and more. Property financing entails many sources of capital, including both debt and equity resources as well as hybrid forms like preferred equity and mezzanine debt. Knowing how to work with these avenues is important to ensuring financial sustainability in real estate assets. Property Finance covers the most common issues encountered, helping readers prepare for and find a way around possible roadblocks. The success of a real estate investment is dependent upon optimal financing, and a mere bird's eye view of the topic does not fully prepare investors for issues ahead: Property Finance provides a knowledge-based approach to real estate investment, detailed information and powerful tools. GIACOMO MORRI, Ph.D., MRICS, is Senior Professor in the Accounting, Control, Corporate Finance and Real Estate Department at SDA Bocconi School of Management and Lecturer in Real Estate Finance at Bocconi University. He is Past-president and Board Member of the European Real Estate Society. He also sits on the board of several real estate companies and works as freelance advisor. ANTONIO MAZZA is Teaching Fellow at SDA Bocconi School of Management. He has been working for almost 25 years in the real estate market for both Italian and foreign banks and he is currently General Manager of "Aareal Bank AG" Italy and board member of several Italian companies within the "Aareal Group". He is Professional Member of the Royal Institution of Chartered Surveyors and a member of several Italian Banking Association.